Ahh, Summer: the time of year when it’s too hot in my kitchen to bake or cook much (central air vents just don’t go with the whole “tenement chic” look I have going on here in Brooklyn…). 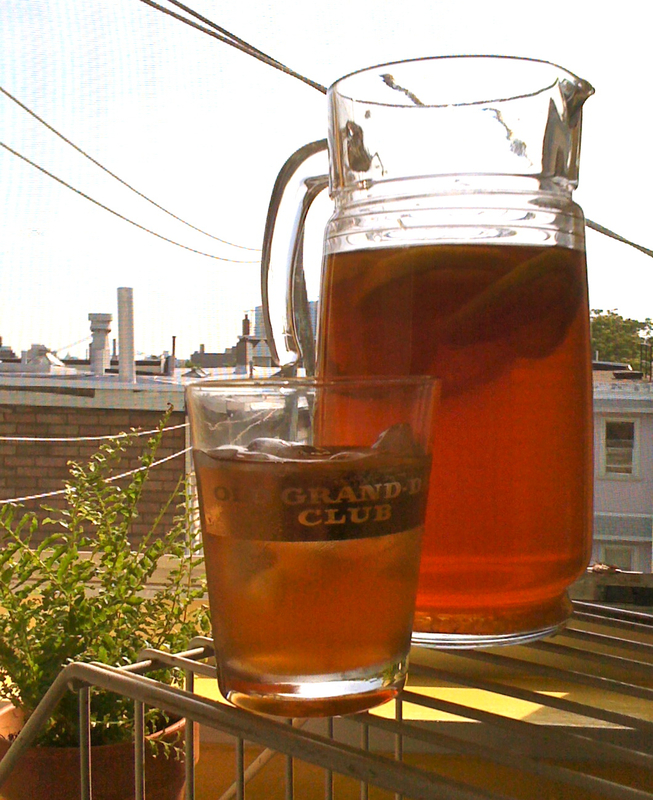 It’s also the best time of year to enjoy my favorite beverage : iced tea! I love iced tea of many varieties year round, but nothing compares to the fresh, home-made kind, and it’s never more refreshing than on a hot summer day like today. It’s so easy to make yourself (you can boil water, I know you can…) and if you have a good stash of tea bags in your cupboard, you can make a different flavor each time and enjoy some beverage variety in your life. Fill up your pitcher about 3/4 full with water (mine is about 1 3/4 quarts), and then transfer the water to a pot/kettle for boiling. Bring the water to almost a boil, and then turn off the heat. Tie 5 Earl Grey tea bags together at their tags, lay a chopstick over the pitcher mouth, and suspend the tea bag bundle from the chopstick into the pitcher (this makes it really easy to remove). I’m sipping it while I write this – it’s perfect – lemony and refreshing, not too sweet and not too tart. Spiked or not, give it a try. Go boil some water! You’ll be glad next time you open your fridge that you did. you better bring those krispie kremes!